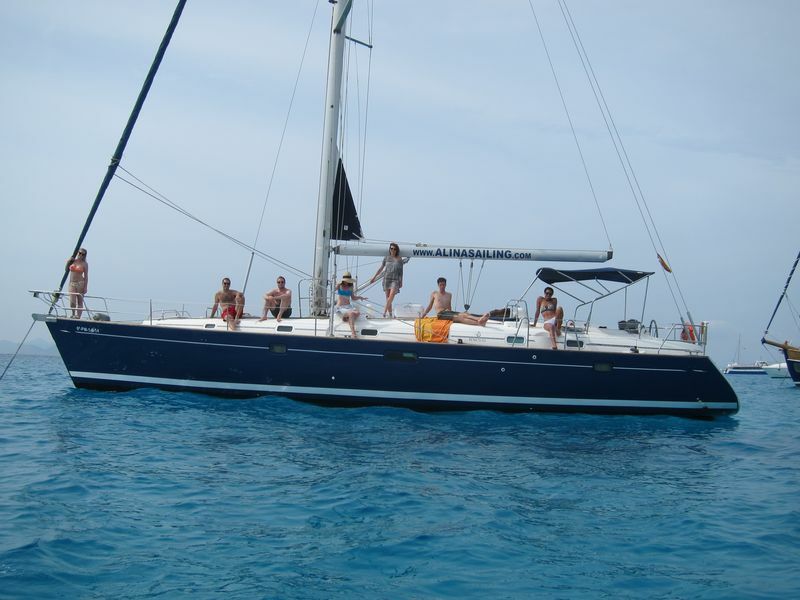 Alina is the name of our skippered yacht charter Ibiza. The boat is a luxury sailboat of the prestigious brand Beneteau, model Oceanis 50, perfect to enjoy your sailboat charter Ibiza for some days. Her owner is Ignacio Morros, the Captain. Alina, sailboat charter Ibiza, is 15 meters length and 5 meters beam. Outside, the blue colour hull contrasts with her white sails. 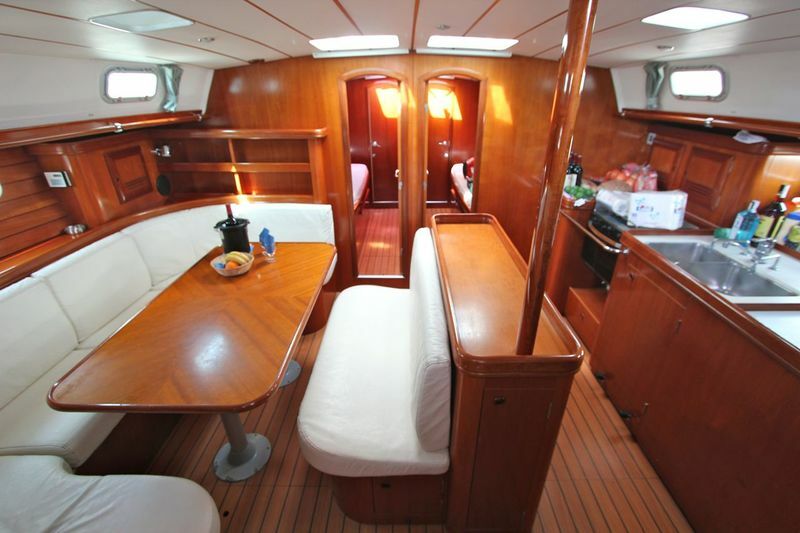 The deck of our sailboat charter Ibiza is made of teak. The cockpit of our skippered yacht charter Ibiza is wide enough and includes a table with two benches in which can comfortably seat up to 8 people ideal for the sailboat charter Ibiza. The sailboat has two wheels, GPS and AIS (Automatic Identification System). The boat is perfect to be used both for the sailboat charter Ibiza for days and for the skippered yacht charter Ibiza for weeks. The sailboat includes as an auxiliary propulsion medium an 80 HP Volvo engine. The three meters length dinghy has an outboard motor Honda to take our customers of the skippered yacht charter Ibiza to the shore and pick them up later. Our boat is perfectly equipped for the sailboat charter Ibiza. In addition, our skippered yacht charter Ibiza, preserves the privacy of our customers maintaining their independence by having a cabin isolated from the rest of the boat for the skipper. This cabin is only accessible from the deck. Alina is the perfect boat for the skippered yacht charter Ibiza. 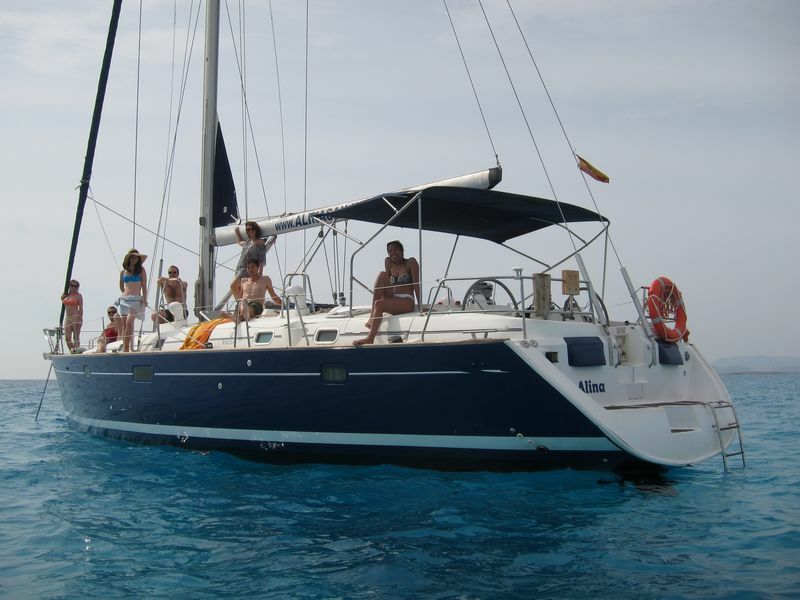 Alina is the perfect boat for the skippered yacht charter Ibiza and for the sailboat charter Ibiza. 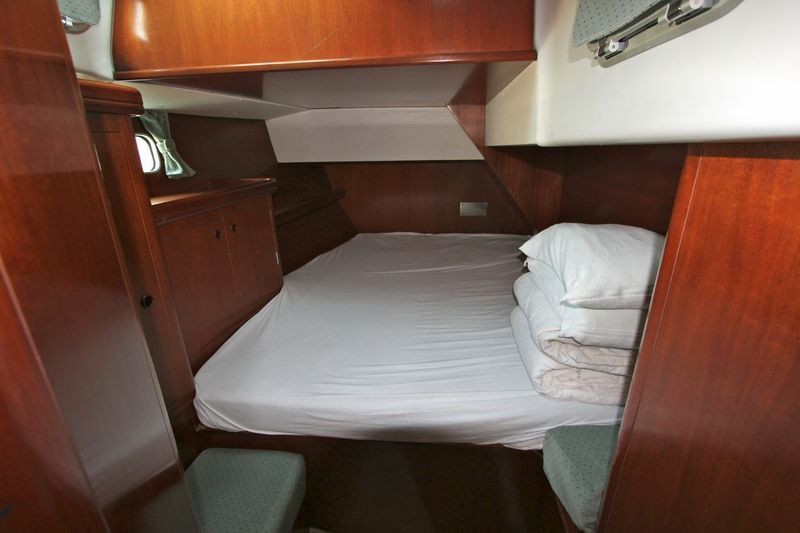 The sailboat has four cabins for our customers. Every cabin of our sailboat charter Ibiza includes its own toilet and individual shower with hot water. The boat is ideal for four couple of friends or families. Inside our skippered yacht charter Ibiza, we find a fully equipped kitchen with oven and two fridges. 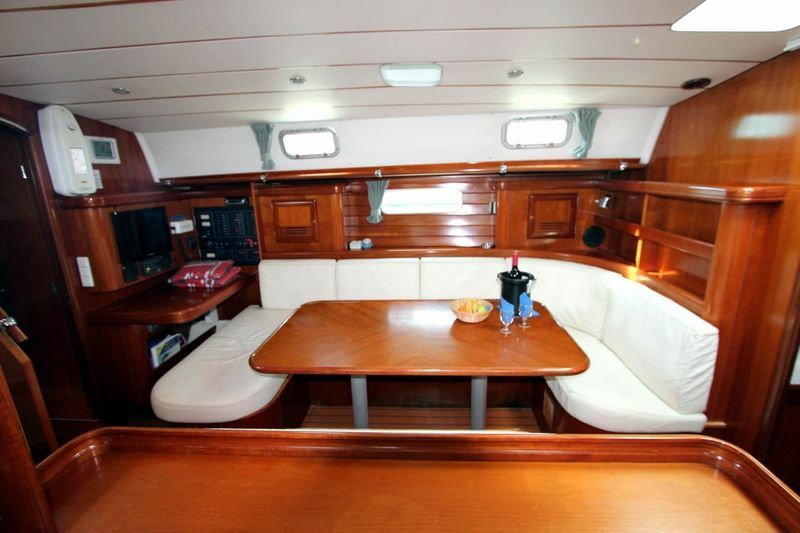 In the living room of our sailboat charter Ibiza, there is a table in which can comfortably seat up to 9 people. Our skippered yacht charter Ibiza is the perfect combination of exciting sailing, luxury and comfort. 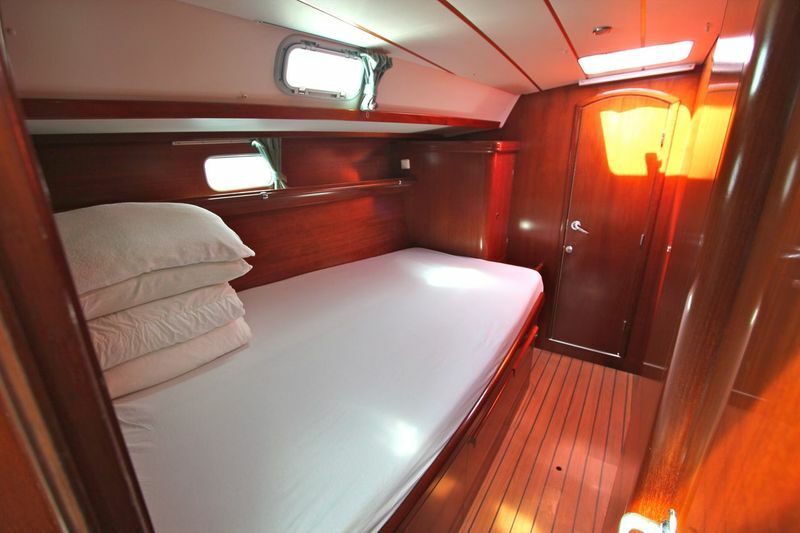 Inside our skippered yacht charter Ibiza, all the walls and bulkheads are made of wild cherry wood. Ignacio Morros is Alina’s Captain, skippered yacht charter Ibiza. 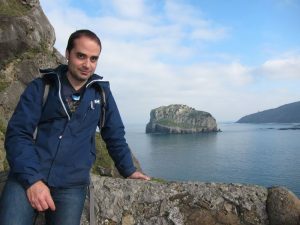 During the last 14 years, Ignacio has been working as a lawyer in a big Spanish Company. But, three years ago, Ignacio knew that he could not live without the sea and he decided to leave everything for his passion, sailboat charter Ibiza. After more than ten years sailing around Ibiza and Formentera, our professional skipper has got a great nautical experience. When he was a child, his parents, during all summers, enrolled him in different sailing courses. Subsequently, after obtaining several nautical licences, he got his Yacht Captain Licence. Finally his hobby led him to turn his passion into his profession by attending different courses of specialization until he reached the degree of Professional Skipper that allowed him to work in skippered yacht charter Ibiza. In addition, Ignacio holds the Ocean Yachtmaster Licence, licence issued by RYA (British Royal Yacht Association). Since the year 2016, Ignacio has been managing ALINA SAILING, sailing school authorized by Spanish Administration to teach the theorical courses and navigation practice required to obtain different nautical licences in Spain. 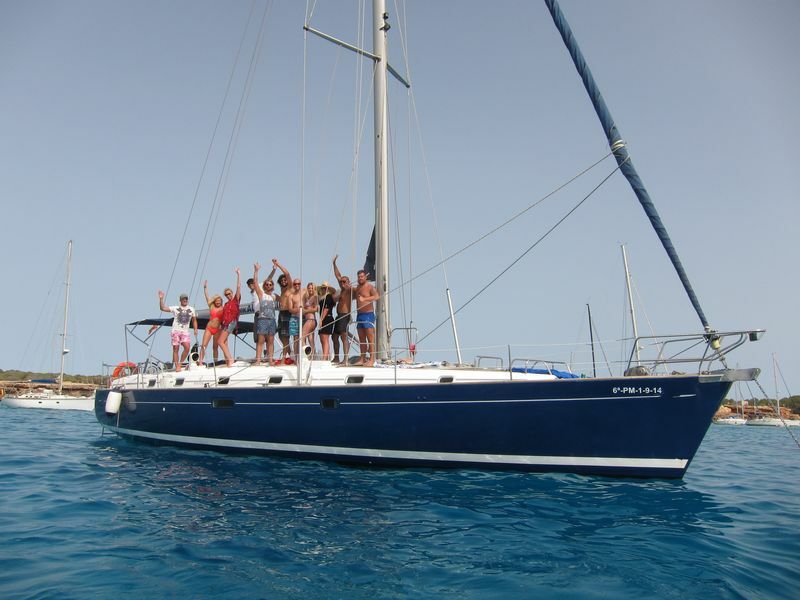 His life, to teach sailing lessons and sailboat charter Ibiza.